Zabaglione is traditionally served with fresh, ripe figs and, in Italy, is known as zabaione or zabajone – the name varies depending on the country. It may have originated in Venice where honey was used instead of sugar, but most likely Piedmont is the Italian region of origin. 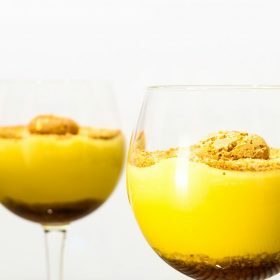 Some say the Italian dessert dates back to 1471, when Captain Baglioni (often called ‘Zvàn Bajòun’), short of food, managed to muster up random ingredients of eggs, sugar and wine, with which he made this creamy concoction. Another story tells that it goes back to the sixteenth century, when it was created in honor of St. Pasqual Baylón (hence similar dessert names sambayon and zabajone), the patron saint of cooks and pastry chefs, who recommended that wives give it to their “tired” husbands (interpret that how you wish). And, believe it or not, more explanations of the dessert’s origins still abound. Traditionally raw egg yolks are used but because of the fear of salmonella it is often prepared in a bain-marie nowadays. My mother made it years ago for my family and I still cook it to this day. Prepare it in a bain-marie or use a simple double boiler with a heat resistant bowl suspended above the water and to simmer extremely gently to avoid scrambling the eggs. It could take a little while, but the result is worth it. This custard recipe is absolutely tasty and easy to prepare. Place egg yolks, sugar, a little freshly grated nutmeg and Marsala in a heat resistant mixing bowl or bain-marie. Place over a boiling water bath and whisk. Keep whisking until the mixture is a pale yellow and doubled in volume. Place mixture in two martini glasses and serve with fruit or biscuits or whatever you can think of to turn it into your own. Serve it with crushed amaretti cookies on top to match the style of the picture above.